I find myself on the other side of the line dividing the heating-dominated climate and the cooling-dominated climate. I’m not oblivious to the cultural implications of this line, but what’s really standing out to me at the moment is the way I’m interacting with this house. Last year a neighbor asked me about going all electric with his home, as his furnace had just been given last rites. He and his wife are professionals with two active school-aged children. My first response as I stood in the grocery isle talking to him, was a caution about how involved one wants to be with one’s home. The technologies we used to cobble together our zero energy home aren’t what I’d consider ready for primetime. Everything works just great, but nothing is integrated. And if we want to be comfortable we have to anticipate and prepare. Not everyone wants this kind of relationship with their home, especially if you have a lot of other stuff going on. At the first mention of having to keep track of the weather and make decisions about how to setup the house, my neighbor said, “Not for us.” He made a decision about his house standing there in the grocery isle that would have taken me six months of agonizing to come to. Indeed we are the brains of our house, which probably doesn’t seem weird considering that we actually have brains and the house actually doesn’t. But most houses really do operate of their own accord, making decisions without assistance from the brain-endowed occupants. The automated systems in the house are there so we humans don’t have to make it all happen. Nonetheless, in our low-energy house we are much more involved. Window position – seems obvious in the winter, but where should they be if it’s going to be 90 deg F out? Basement temperature – do we need to change what the heat pump water heater is doing, or start using the basement woodstove to prevent the basement being too cold in the spring? 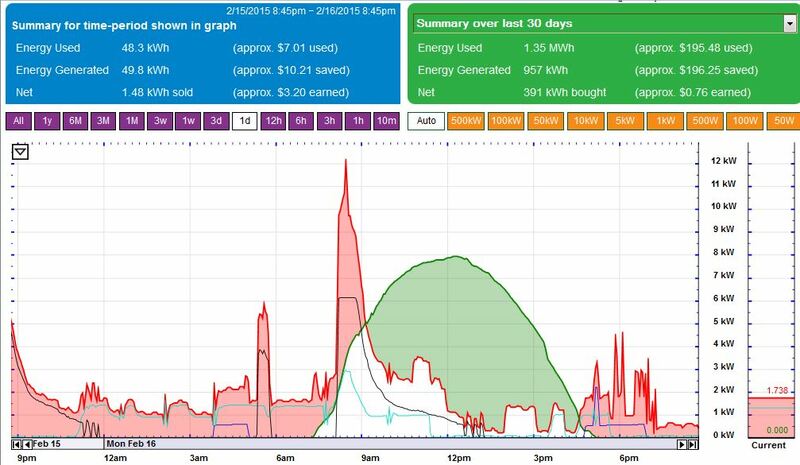 Snow cover – if the solar panels are covered and it’s going to be sunny, get out the roof broom! We’re finally ready to start on what I consider to be the defining feature of a Zero Energy Home. Our walls are only 4″ across, leaving precious little room for insulation. While most folks doing energy improvements on their homes would do what they can within the wall thickness they have, to do zero energy right you generally need more than 4- or even 6″ of insulation. Keep in mind I’m talking about the Vermont climate: about 7000 heating degree days. In milder climates 6″ of well-installed insulation might be enough. 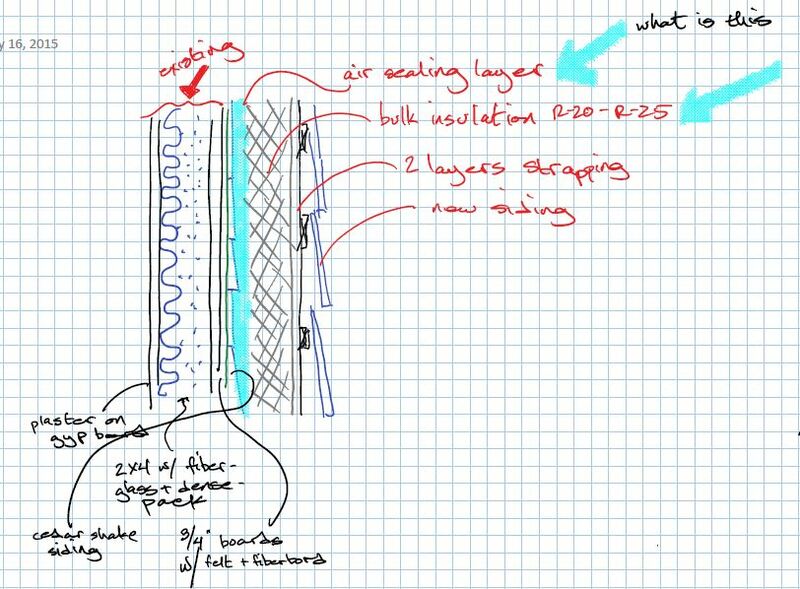 How do you put more insulation in a wall than will fit in a wall? You have to make the wall thicker. And that is why most energy improvement projects just color within the lines when it comes to the walls. A thicker wall means you either rebuild the inside of the wall: very messy, disruptive and expensive; or you rebuild the outside of the wall: requires new siding, moving the windows, and also very expensive. Between the two, thickening the wall to the outside is generally more effective and slightly less expensive. Plus, it’s a chance to renew the look of your house. The reason I say a thickened wall is a defining feature of a Zero Energy Home is that the whole zero energy thing is a little over the top at almost every level: oversized solar, super energy efficient appliances, whole home energy monitoring… But the whole is greater than the sum of the parts, so you have to go the extra mile on all this stuff or you don’t get the zero energy special sauce. Having superinsulated walls makes something magic happen: the house keeps itself warm. Some day, once we get these walls done, the house will be warm everywhere, with just a little bit of heat introduced in the dining room. Designing a thickened wall is no easy feat. There are too many competing considerations: cost, aesthetics, effectiveness, greenness, longevity… And there’s an overriding threat that if you do it wrong the wall will load up with water and become a giant moldy diaper draped around your house. As an aside, we have exactly this diaper situation with the wall behind our bed. Whenever it rains and then gets warm we can smell the house composting as we snuggle down to sleep. Here’s the problem with the wall behind our bed, exposed when we had cellulose pumped into the walls. The white stuff is spray foam covering the cellulose hole. It appears that the addition has no house wrap (tar paper, or the more modern Tyvek) behind the siding. Bad or non-existent flashing at the window has allowed the wall to get wet. We can smell the wall rotting away on rainy days. When we thicken this wall out with more insulation and new siding, this rotten spot will have a chance to dry out and be protected from the weather. I think it will be ok to leave it as long as we cover it up before it becomes a structural problem. Original plaster wall – very stout and heavy: not gypsum board! No plastic behind the wall board. I don’t think plastic had been invented when this house was built. Original 2X4 stud wall with a messy combination of fiberglass (original) and densepack cellulose (added two years ago) between the studs. Original 3/4″ wood board sheathing. This is the good stuff. No plywood in this house. Except the diaper wall on the addition. Ice and Water Shield, peel-n-stick membrane. This will be my air tight layer and my water/vapor-proof layer. Where you put this layer is very important for diaper avoidance. I think this is a good place to put it. At this point in the wall there is currently tar paper and siding, but that will be removed. A new 6″ or 8″ framed wall stuck on the outside of the building, filled with cellulose. OSB – not my first choice, but my builder has talked me into it. Some kind of drainage plane house wrap: allows water behind the siding to drain away while keeping the OSB dry. New siding: hopefully cedar, but maybe vinyl. We’re getting the whole thing priced out right now. I’m sure the design will evolve at least a little. We’ll let you know what the price is per square foot. An early idea about thickening the wall for more insulation had the original siding left in place. 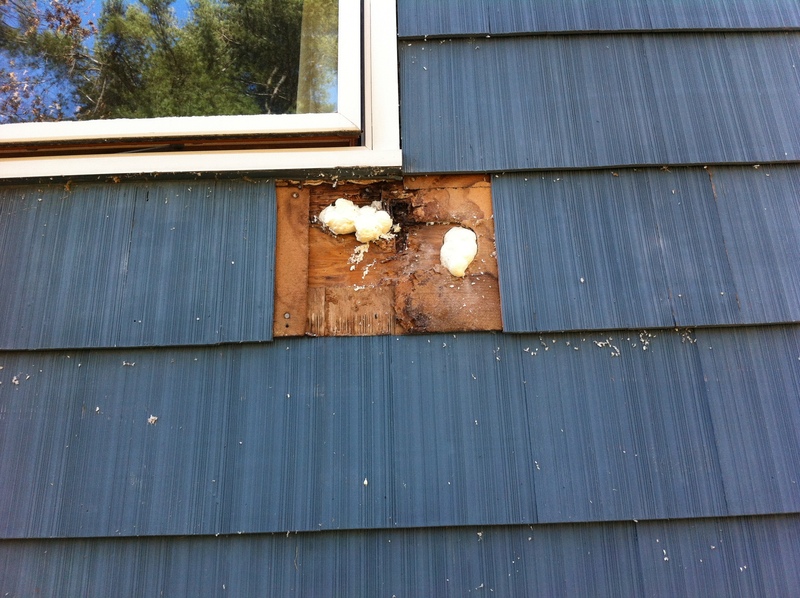 Spray foam over the siding would seal it, and all the lead paint would be encapsulated, never to pollute again. I like this approach because it saves the time and landfill fee of removing the siding, but my builder convinced me it makes all the subsequent construction easier if the siding is removed.